Transportation has always been an indispensable aspect of humanity, and since the invention of the wheel, transportation systems have evolved leaps and bounds. And yet, there still is strong scope for further improvements. The advent of intelligent transportation system (ITS) has been a boon for the companies and organizations that relate with transferring of personals or goods as it offers them efficient management measures with security, time saving, environmental protection, and telematics, among other benefits. According to this business intelligence publication, the demand in the global intelligent transportation system market will expand at an impressive CAGR of 12.7% during the forecast period of 2016 to 2024. The analysts of the report have evaluated that the opportunities in the global ITS market translated into a revenue of US$20.22 bn in 2015 and have estimated it to swell radically up to US$57.44 bn by the end of 2024. Increasing emphasis on public safety on the back of forever incrementing cases of road mishaps, growing need to employ advanced systems to manage traffic congestions, government support for effective traffic management, and rising demand for ecofriendly methods are some of the key factors augmenting the demand in the intelligent transportation system market. On the other hand, factors such as high installation cost, slowness of infrastructural improvements in several emerging economies, and the lack of interoperability and standardization are some of the restrains hindering the growth of the intelligent transportation system market. Nevertheless, vendors of this market stand to gain new opportunities from the rising need for smart vehicles that are integrated with mobility technology and the growing requirement for public-private partnerships (PPPS). On the basis of the type of product, the report segments the global intelligent transportation system market into advanced transportation management systems (ATMS), advanced traveler information systems (ATIS), advanced transportation pricing systems (ATPS), cooperative vehicle systems, advanced public transportation systems (APTS), and automatic number plate recognition systems (ANPR). Among these, the former segment of ATMS provided for the maximum share of demand in 2015 and is primed to sustain its prominent position throughout the forecast period. Growing demand for traffic control solutions across various cities in the world, especially adaptive signaling systems, is the primary driver of this segment. That being said, the demand for the APTS segment is projected to expand at an above-average growth rate, which can be attributed to heavy investments that public transportation operators have made on electronic fare collection systems and dynamic display systems. Application-wise, this report on the global ITS system market bifurcates it into road safety and surveillance, traffic management, public transport, freight management, automotive telematics, environment protection, road user charging, parking management, and automated vehicles. Geographically, North America is currently the most profitable region in the global intelligent transportation system market, and is expected to remain so throughout the forecast period of this report. Strong government support, resilient research activities to harness the possibilities with ITS, and increasing public and private partnership are some of the factors driving the North America intelligent transportation system market. Not just the U.S., Canada and Mexico are also implementing strong transportation standards, which will reflect from growing demand from this region in the near future. While Europe currently holds the second position in terms of demand for ITS, Asia Pacific is primed to provide for demand that will in incrementing at an above-average CAGR during the forecast period of 2016 to 2024. Hitachi Ltd, Siemens AG, Nuance Communications Incorporation, WS Atkins PLC, EFKON AG, Iteris Inc., Garmin International Inc., Telenav Inc., TomTom NV, and Thales Group are some of the notable companies currently ahead of the curve in the global intelligent transportation system market. Population in urban areas is increasing very rapidly and it is expected that more than 70% of the world’s population will live in metropolitan areas by 2050. This growth in urban population along with rising number of vehicle owners is increasing the demand for better transportation networks. In the last two decades, both developed and developing countries faced increasing traffic congestions. An intelligent transportation system (ITS) is broadly defined as integration of information and communication technology with the existing transportation network for higher traffic efficiency. Japan, U.S., UK and Germany represent the developed markets for ITS. Most of the ITS technologies are first developed, implemented and tested in these countries. The first ITS system (Electronic Route Guidance System) was originated in 1996 in the U.S. During the same period, Japan introduced the first Comprehensive Automobile Traffic Control System (CATC). These countries observed a massive improvement in the performance of transportation network operations after deploying ITS systems. ITSs helped these countries to improve the efficiency of their existing transportation networks, reduce fuel consumption and the number of road accidents. Vehicle manufacturers in developed markets such as Japan, U.S. and UK are increasingly installing navigation and infotainment devices in their new models. In addition, there is a huge potential for after-market telematics as several car owners are integrating this technology to access real-time traffic information systems. Due to increasing demand for automotive telematics devices from both car manufacturers and owners, the ATIS market is expected to witness a fair growth through the estimated period. Garmin and TomTom are some leading players in the U.S. in after-market automotive telematics industry. In Europe many automotive OEMs partnered with car manufacturers to install after-market telematic systems on their manufactured cars. Transportation system plays an important role in a country’s economic and social development. Metropolitan cities around the world are facing a challenge from increasing traffic jams due to continuous increase in population, vehicle owners and limited road networks. This results in increased fuel wastage, traffic time and monetary losses. According to Texas A&M Transportation Institute, on an average Americans spend more than 5 billion hours in traffic and purchase an extra 3 billion gallons of fuel costing more than USD 120 billion per year. Traffic jams are a major problem in several other major economies across the world, which significantly affects their economic and social growth. Deployment of ATMS in urban and inter-urban road networks improves the efficiency of utilizing existing road networks. This minimizes financial burden on transportation authorities and governments by reducing necessary investments required in road network expansions for congestion control. This benefit fuels the demand for traffic management solutions across the world. Aggressive demand for traffic management solutions is expected from emerging countries such as India, China, and Brazil due to rapidly growing congestion problems in their major cities. 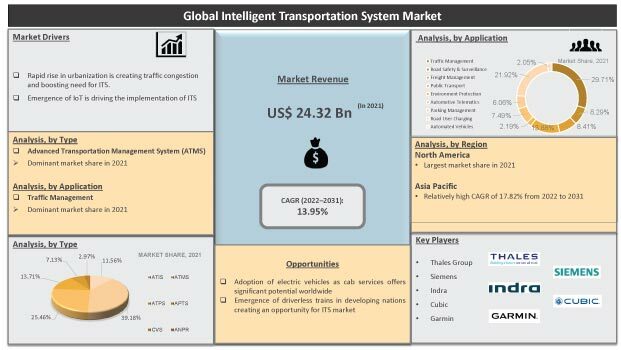 Globally the intelligent transportation system (ITS) market has been broadly segmented into North America, Europe, Asia Pacific and Rest of the World (RoW). North America accounted for the major market share in the global ITS market in 2015 and is expected to maintain market dominance throughout the forecast period. Strong government support, research activities and public-private partnerships aimed at improving the transportation network are major influencing factors for ITS growth. Canada and Mexico are now implementing U.S. transportation standards to improve performance of their transportation networks. This represents strong growth in these markets. This report provides strategic analysis of the intelligent transportation system market and the growth forecast for the period 2015 to 2024. The report cover competitive analysis of various market segment based on product type and end users and an in depth cross sectional analysis of the intelligent transportation system market is provided across different geographic segments.